What is dignity? And why is it so important? My blog is all about being fabulous despite the circumstances of your life. Despite the curveballs that life throws at you. 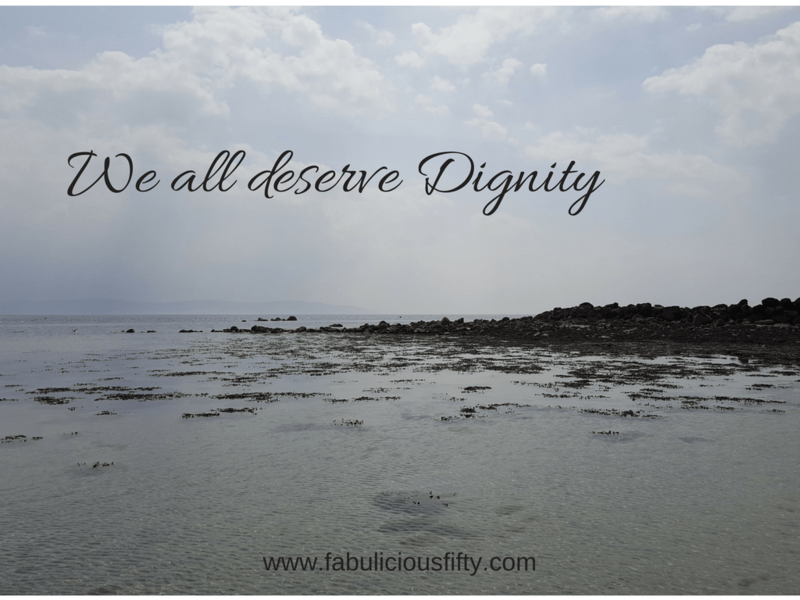 Your dignity is something that is truly integral to your fabulousness no matter what age, gender or circumstance. Over the past five years (and a bit more perhaps) a lot of things have come across my path. I have been a victim of gaslight bullying in the work place. My health as also been a huge struggle, most especially with my arthritis, which has been stripping me of some of the things that I perhaps took for granted. It is some of these situations that has made me realise how important dignity is. If dignity has been stripped from you – for whatever reason, it isn’t the easiest thing to get back. Walking tall and acting confident when you are crippled with pain or humiliation is hard. The first time I walked out with Stan, my trusty walking stick was hard. Not simply because I thought people would be looking at me and questioning , but because I felt vulnerable. Vulnerability is closely linked with dignity. When I feel vulnerable, be it a situation when I had to return to the office after a humiliating dressing down, or when I had to introduce Stan to my date. I feel vulnerable when I am faced with a plate of dinner that I know I cannot cope with (there are days when I cannot cut my food because of pain in my hands, and many days when I know I will be decorating my clothes with the food that I might spill). I feel vulnerable when I need to ask for assistance to carry my tray in a restaurant and even on a very bad day when I cannot pick up a cup of tea. There are days like this – perhaps more than I would like. After several attempts, trying to get my essential fix of tea, I realised that lifting the cup was not an option. I asked for a straw which was delivered with a smile and with an attitude that didn’t make me feel vulnerable. This kind woman understood dignity. No two people are alike and there are many people living with disabilities both visible and invisible. This month is autism Awareness month and I am delighted to hear of many supermarkets introducing shopping hours where attention has been paid to decreasing light, sounds and other sensory stimuli. I will certainly be taking note of these. As a result of my conditions I am hypersensitive and find shopping overwhelming at the best of times. Invisible disabilities (very like me on a good day when I don’t have my stick or hand splints) are exactly that. They are invisible. These include depression, arthritis, fibromyalgia, lupus, and MS just as a start. Anybody going about what seems like daily life with these conditions is fighting an uphill battle and dignity is part of that. So how can we help people to maintain their dignity? Firstly as mentioned above we don’t know who is struggling. So why not show everyone respect. It is old-fashioned I know but if you are sitting on a train or tube and know that you are ok to stand, offer your seat. I promise there is someone who is struggling to stand and maintain balance. Be aware. It takes so little to hold a door open, to perhaps notice that someone needs a little help, perhaps with carrying a tray or a cup of coffee. Perhaps allowing someone to go ahead of you in the queue. These are all little actions that will allow someone to maintain their dignity and not feel quite so vulnerable. In close relationships, family and friends who know what someone is going through it is both easier and harder. My advice would be to again be aware, be conscious of what things might be difficult, and simply help silently. I had visitors over the Easter weekend and every day I realised that little things had happened. My bin had been cleaned thoroughly, the back garden was tidied, the dishwasher had been packed and unpacked. I didn’t ask for help, but it was given. And I am so grateful. Acceptance is key. If there is a person in your life who is disabled in any way, simply accepting them for who they are is a wonderful gift of dignity. When I was in a new relationship, I was shy about introducing Stan the Stick. Eventually we were going on a trip and I knew I would need the support of my stick. I remember asking my Mom. If he doesn’t accept Stan he isn’t the man for you. Wise woman! I just loved the day when he suggested bringing Stan out with us. It may seem odd, but the little things I do for myself to feel better, and to maintain my dignity are important to me. I like looking good. I love my fashion and style. If I am going out (and even sometimes staying in) choosing great clothes, doing my hair and spending time on my make-up give me that added confidence boost. I also of course rely on the old favourites of pain relief, mindfulness and rest. A great day out feeling totally dignified has a lot of planning behind it. Thank you to all the wonderful people who I share my life with. My friends who know and the strangers who don’t. Allowing me my dignity is a gift. « The Delights of Manchester and More! A little thought goes a long way. Common basic curtesy can make someone elses life just a little easier. Great post Kerry. As someone who has MS I totally get what you’re saying. When the time came that I needed to use a stick I decided I might as well go all out so painted it purple and stamped blue cats on it. Oh I love that! Bling it up. Thank you so much for commenting.